French provincial décor adds to the old world feeling of privileged luxury in this Eiffel Tower adjacent Paris apartment rental. 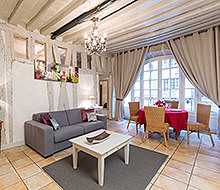 Ideally located in Paris Uber Chic 16th district. 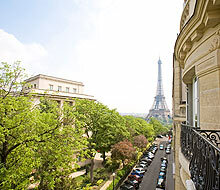 Trocadero Palace is one of the prettiest Haussmanian buildings and this 4th floor apartment has been renovated to reflect the building’s high-end pedigree. Filled with antiques from the 18th and 20th centuries, featuring two en suite marble bathrooms and antique flooring, this is a truly opulent apartment.When you have finished admiring the interior, step out onto the wrought-iron terrace for an amazing view of the city! The apartment building is on a private gated street, with available parking. It has a beautiful, large entry hall with an iron and stone staircase, plus elevator. A gorgeous salon, to call it a ‘sitting room’ really doesn’t do it justice, with built-in bookcases, beautifully ornate fireplace, floor ceiling windows and soft, comfortable seating. There are the usual home entertainment facilities one would expect including cable TV, stereo CD player, WiFi/DSL internet and incoming/outgoing phone with free connection to the US, so you can call in sick that extra day. 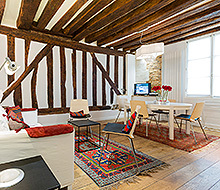 2 spacious bedrooms, beautifully decorated, each with queen sized bed and en-suite marble bathroom. Kitchen with bespoke cabinets and all modern conveniences. The dining area is contained within the large kitchen, allowing for an intimate cooking/dining experience. There is also a good-sized study with a sofa bed to accommodate an overnight guest. 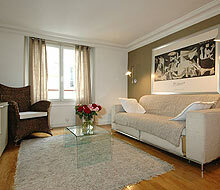 All in all a beautiful high-spec apartment offering a genuine Parisian ambiance. One for the discerning traveler. Wonderful! As usual! Great location, actually perfect location, terrace was wonderful in October. Spectacular Trocadero apartment. Beautifully appointed, well located, large with a great view. Served as the base for two couples celebrating a milestone birthday in Paris. Christine and the staff was very helpful in providing concierge service. Will definitely return and highly recommend.